What devices do the Razer Hammerhead USB-C work with? Please remove any attached silicon tips. Then take a soft cloth that is lightly saturated with warm water and carefully wipe down the ear buds. Be careful not to allow liquid to penetrate the actual speaker. The silicone tips and cords can be cleaned the same way and allowed to dry before re-installing. First confirm the issue is with the headset itself and not your audio source. ( To do this you can simply try the headset using a different source and see if the issue is still there.) Because earbuds come in direct contact with your ears, wax can sometimes build up and cause issues with the audio quality and output levels. To clean your earbuds remove any silicone tips that are installed and follow the directions below. Take a soft cloth that is lightly saturated with warm water and carefully wipe down the ear buds. Be careful not to allow liquid to penetrate the actual speaker. If desired the silicone tips can also be cleaned in the same manner. The Razer Hammerhead USB-C's silicon ear-tips are designed to fit snugly into your ear to keep music in your ear and at the same time keeping external sound out. 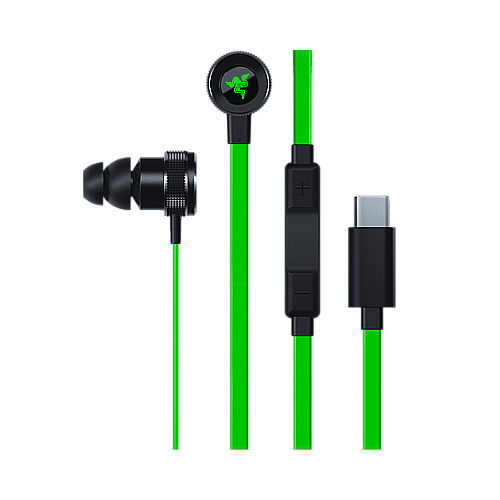 Included in the packaging are ear-tips in three(3) different sizes to ensure that you have the perfect fit for you Razer Hammerhead USB-C earphones. Does the omnidirectional microphone on the Hammerhead USB-C have any controls? Yes, you can control volume and pick up calls with the Razer Hammerhead USB-C in-line control. Can I use the Razer Hammerhead USB-C on my PC? Yes, you can, if your PC has a USB-C port. What accessories are included with the Razer Hammerhead USB-C? The Razer Hammerhead USB-C comes out of the box with a carrying pouch, small, medium and large eartips and a pair of bi-flanges. If you're unable to find an FAQ article that helps resolve the issue, please contact our Customer Support team here. User guides and product manuals are also available on the Razer Support page.